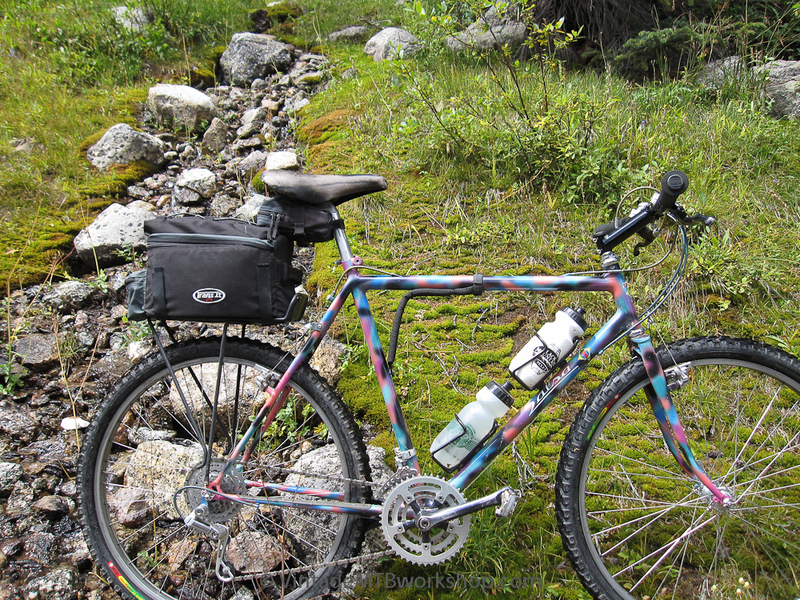 Ross Shafer built Salsa #18 for his wife at the time, and she rode the bike in the 1983 Pearl Pass Tour. 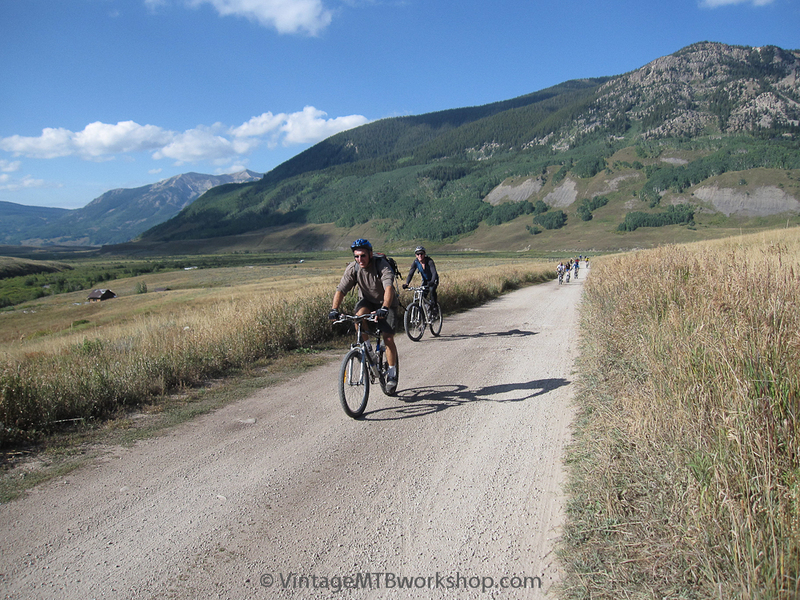 This ride is dubbed the "oldest mountain bike event in the world." 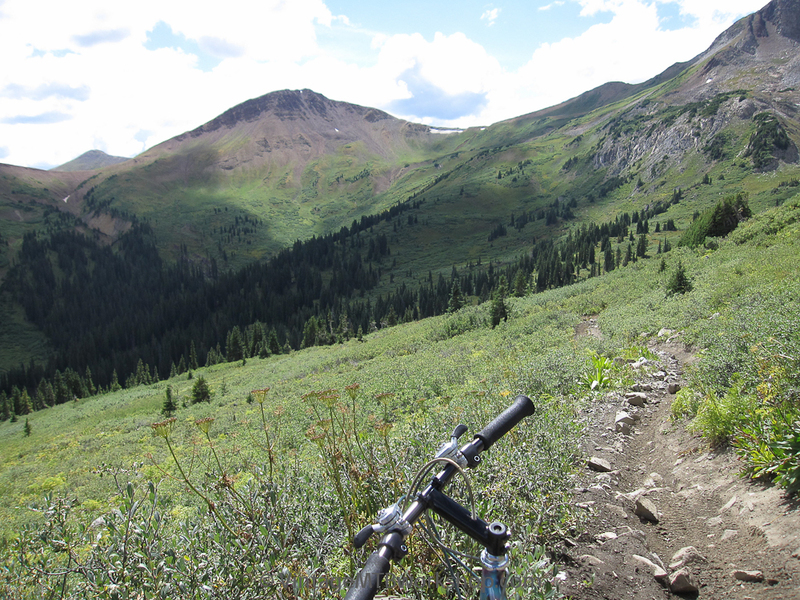 While not the most enjoyable riding experience in the area, it certainly covers challenging terrain with spectacular views. 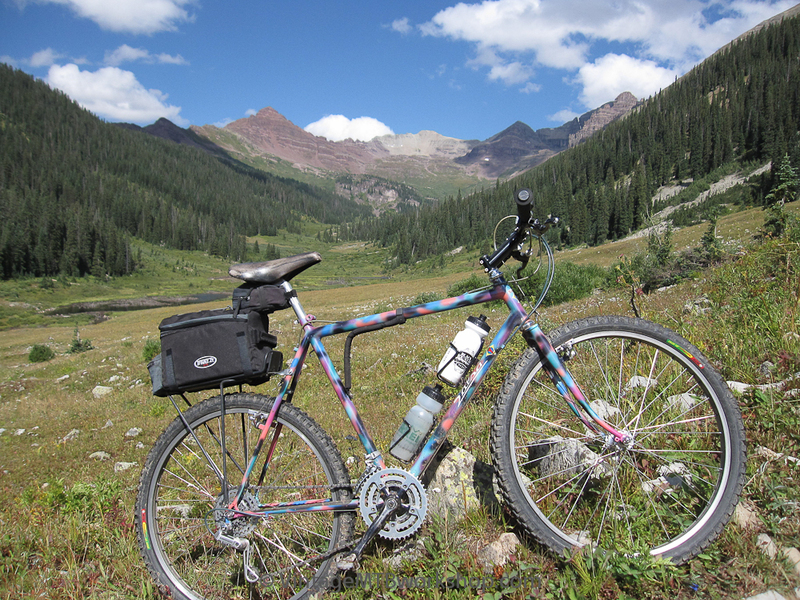 In a world full of modern mountain bikes with disc brakes and full suspension, it is an added challenge to take an original bike back 28 years later to participate in the event. 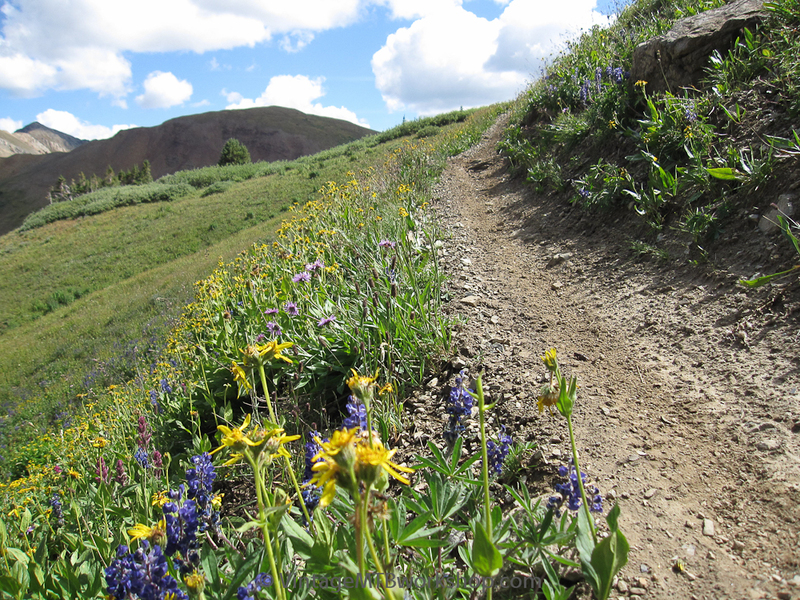 The two-day round trip distance constitutes 80 miles with 12,000 feet of elevation gain. The bike was modified as little as possible for the event from its original configuration, only changing out the pedals, tires, and chain (which was stretched by almost an entire link). Everything else was kept the same, including the Ambrosio rims that lack any sort of hook bead to hold the tires. A second bottle cage and a rear rack were added. 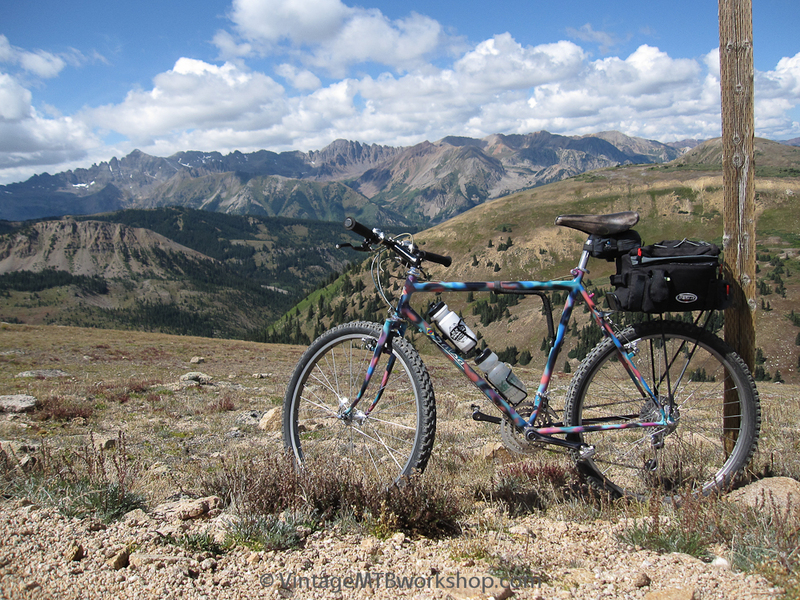 For logistical reasons, the bike would actually be ridden from Aspen to Crested Butte the day before the Tour, while carrying overnight supplies. 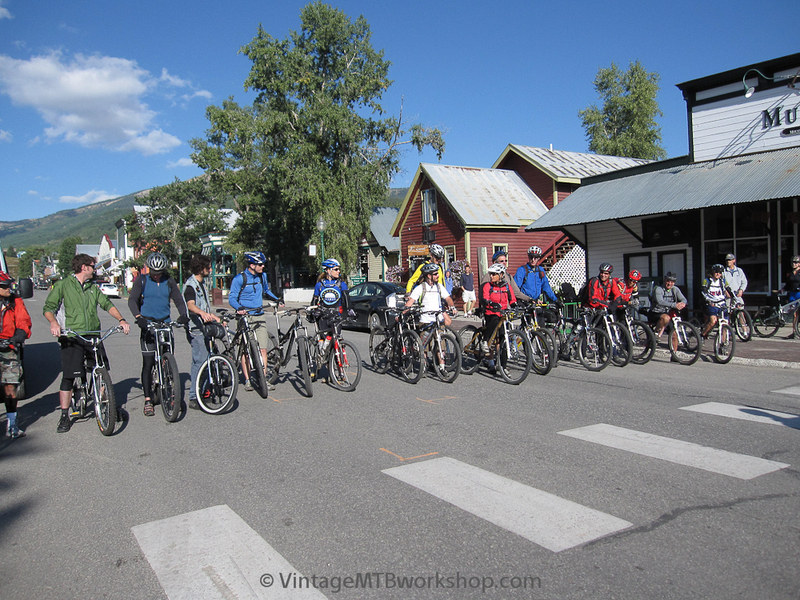 The route to Crested Butte is much more challenging than the Tour itself, so it was necessary to prepare to spend a possible night out on the trail. The adventure began on a Friday morning at 4 AM with a drive to Aspen. 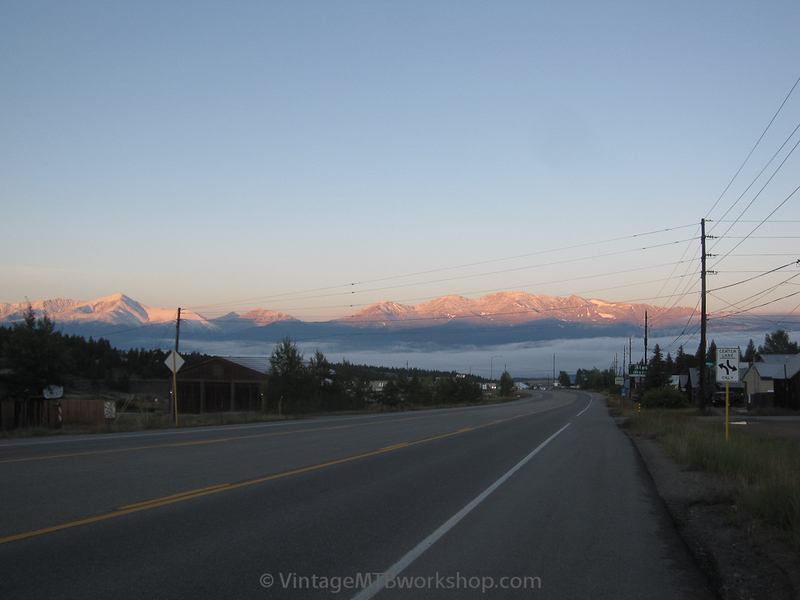 Passing through Leadville at 6:30 AM, the town was cold and asleep, with the sun first hitting the Collegiate Peaks. 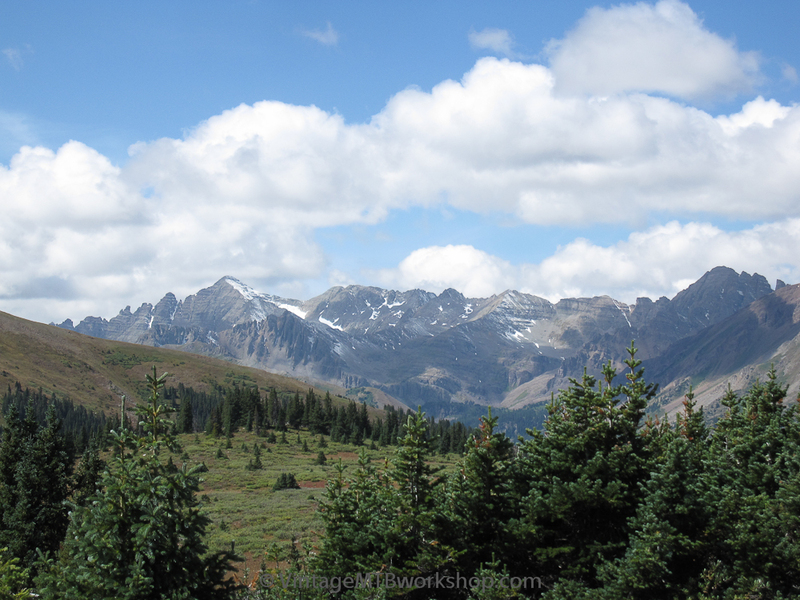 The fresh dusting of snow was not a welcome sight, but as it turned out the Aspen side of the mountains was much warmer. 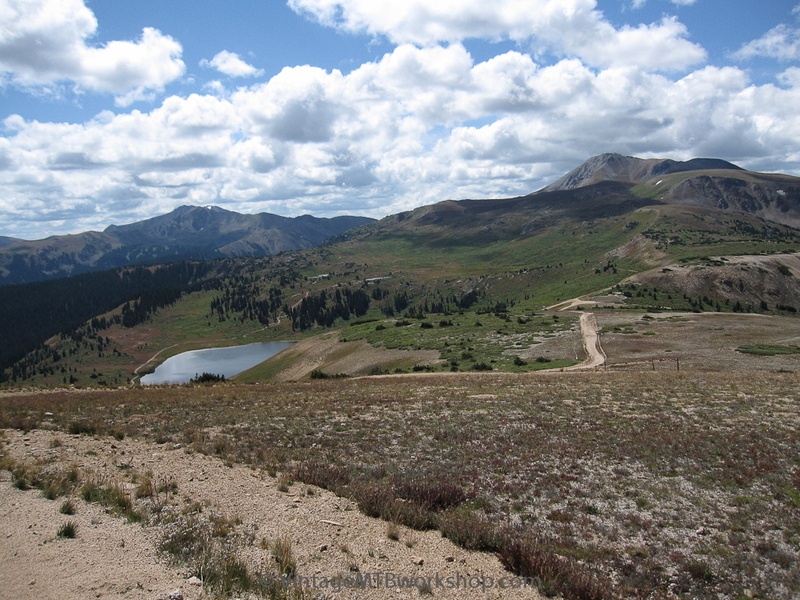 The jeep road wasn't exactly a walk in the park, and went up and down between 11,000 and 12,000 feet in elevation. 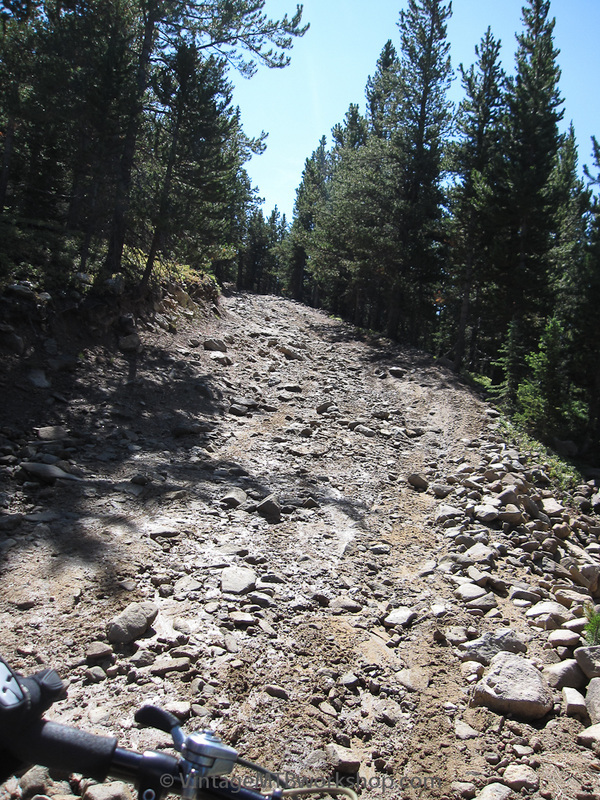 The surface wasn't smooth either, and some inclines were around 25 % and difficult to walk. 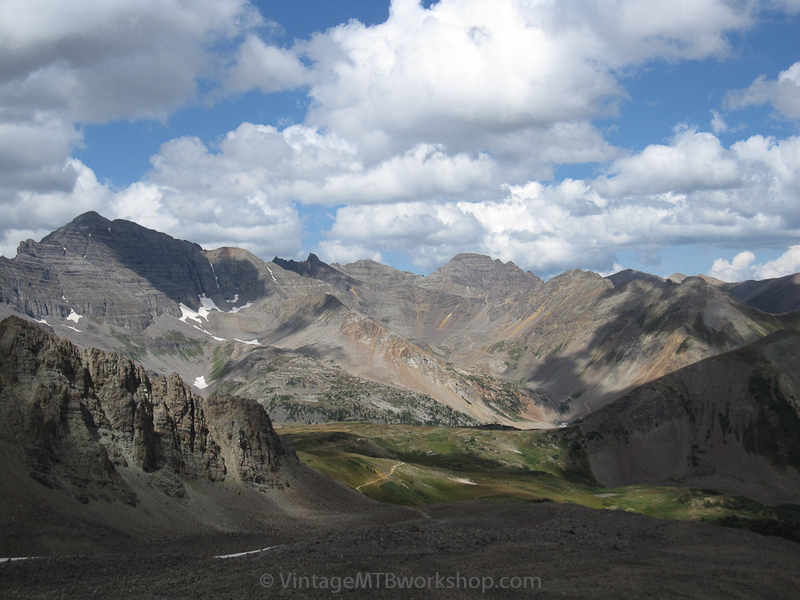 A look down at Taylor Pass. 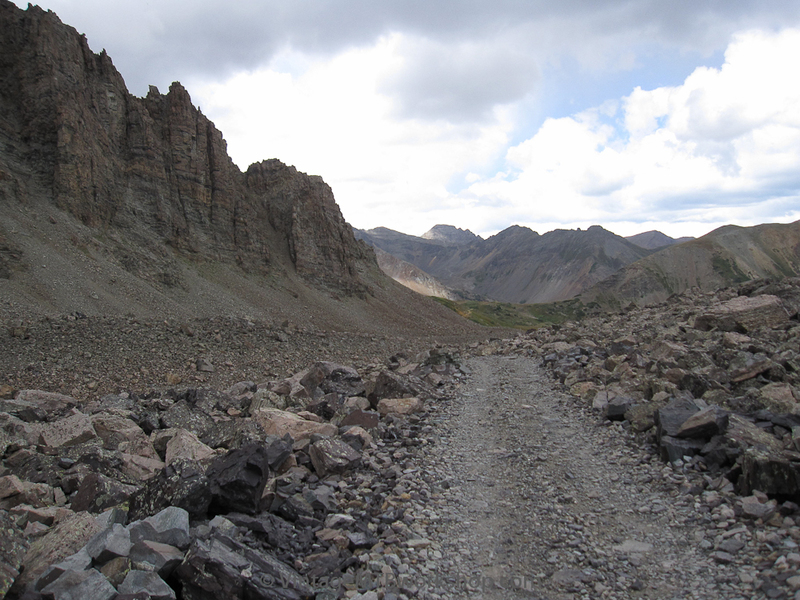 The route continued around the lake and over the ridge in the middle of the photo. 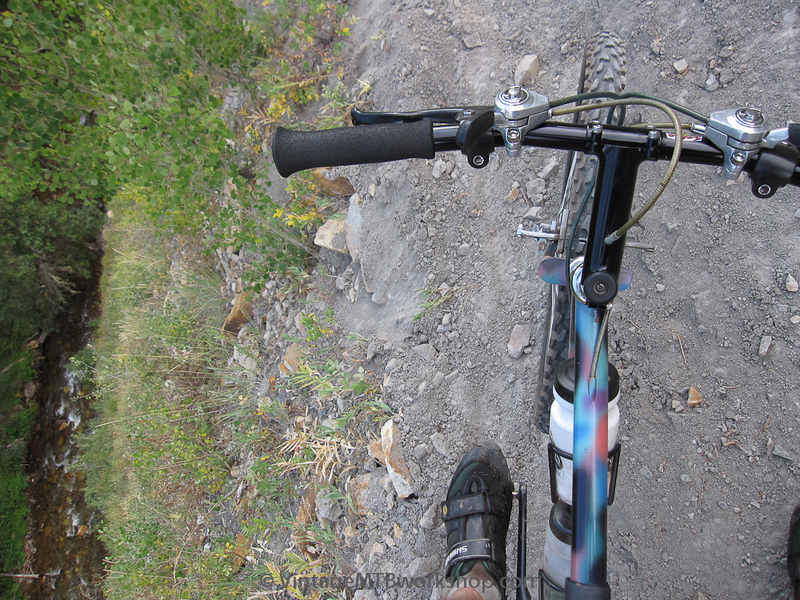 High stakes single-track, with a 150 foot drop or so right into Brush Creek. 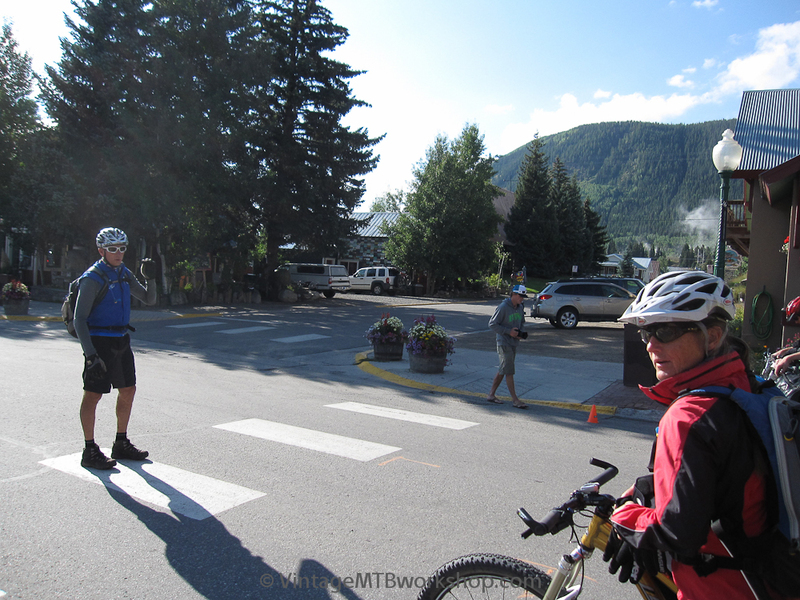 Saturday morning saw the start of the 35th Pearl Pass Tour, with an appearance by an original rider named Albert from the first Tour in 1976. 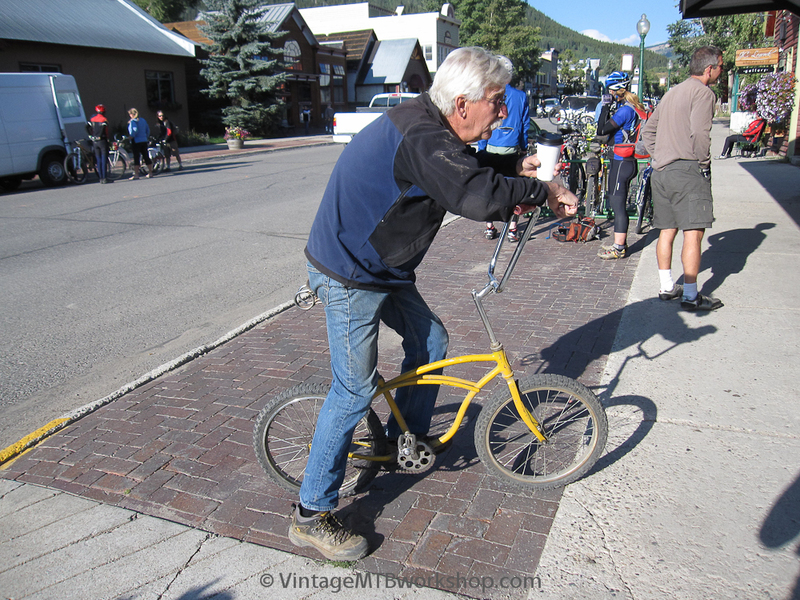 In those days he rode a bike much like this down the back side to Aspen. Don Cook (left) giving some final instructions, with his wife Kay Pederson-Cook (aka the "Hagen-Daz Girl" from the 1980 Tour) is seen off to the right. Eventually the time came to start pushing. 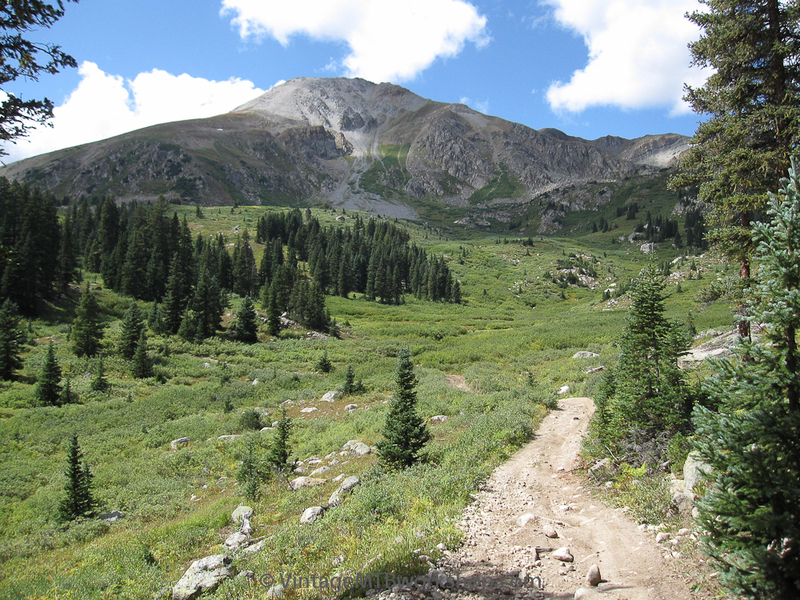 A view from the summit of the Aspen side and the very rough descent ahead. 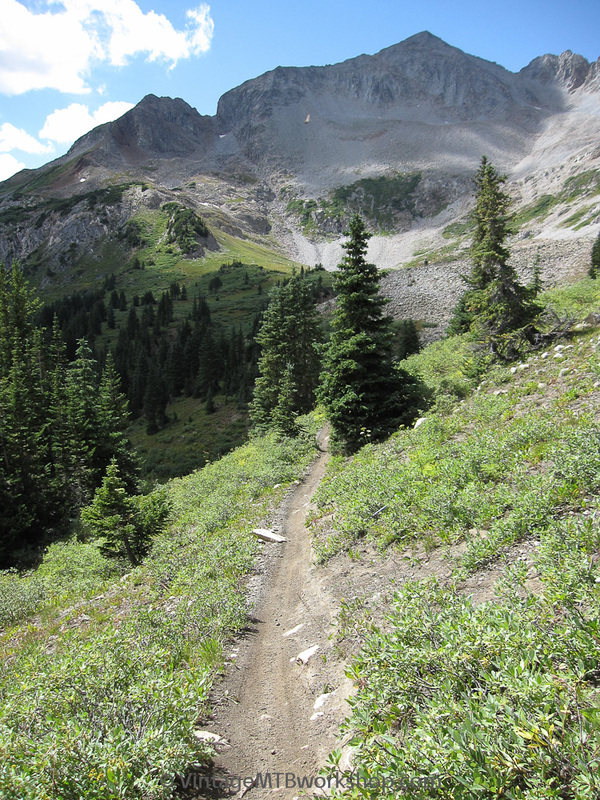 The terrain off the back side of the pass is almost lunar, and in the early years was a real testing ground for the bikes. 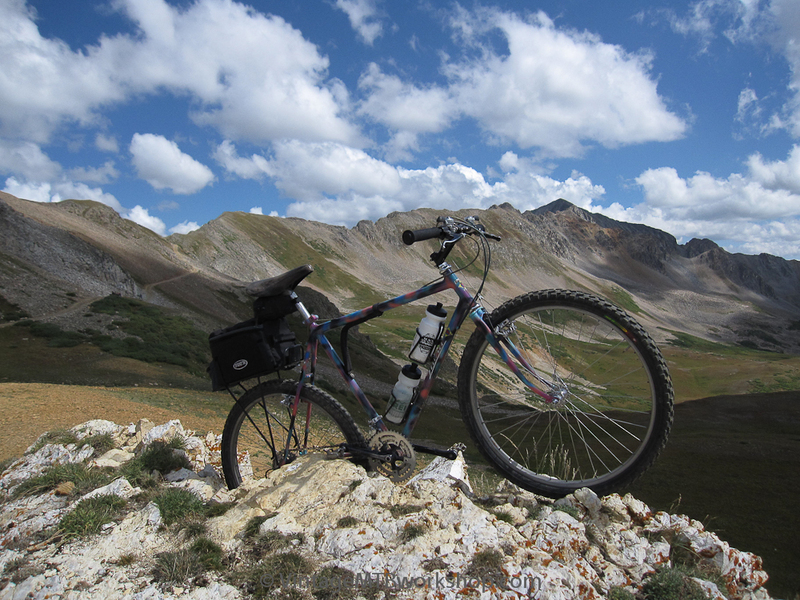 With a rigid bike as old as the Salsa, it was necessary to pick a careful path through the boulders, while the full-suspension 29ers when flying by. 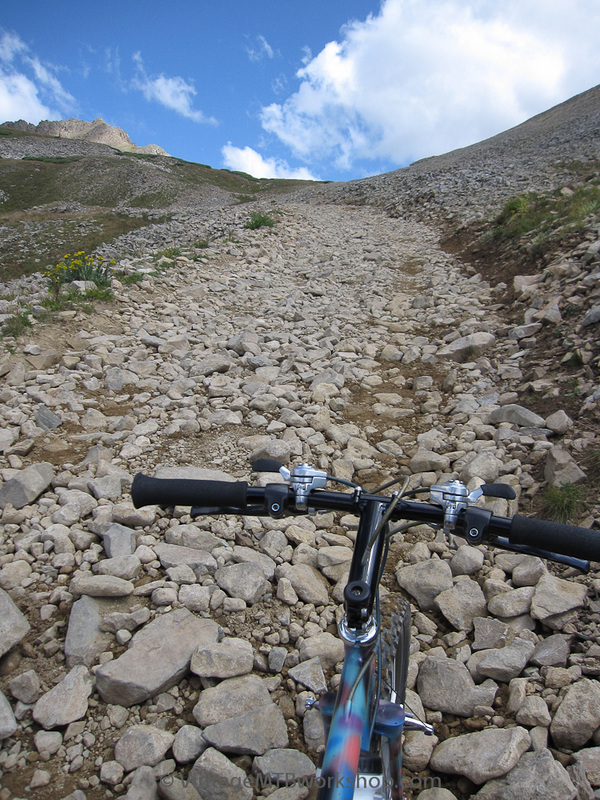 This section was a real reminder of how little margin of error a fully rigid bike has on this sort of terrain. 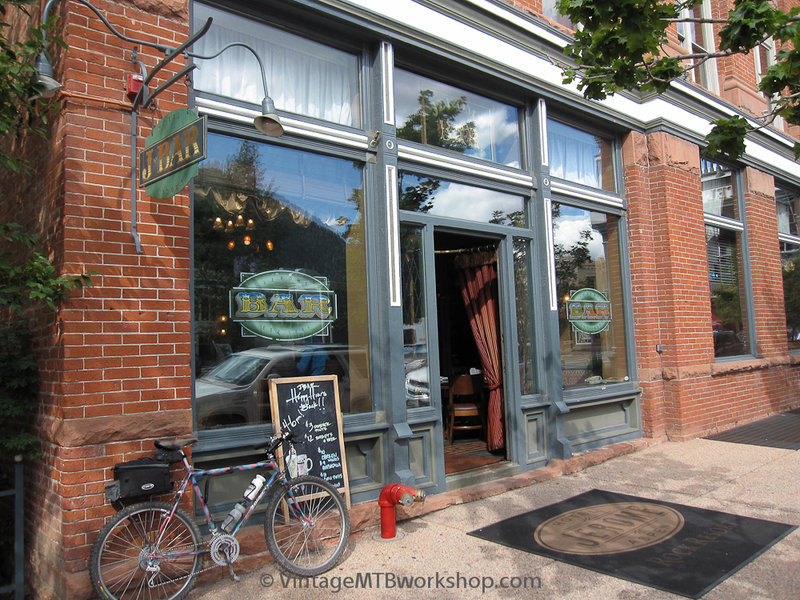 Down in Aspen, the Salsa made a quick appearance at the Jerome Bar and Hotel, which was the traditional end of the Tour. 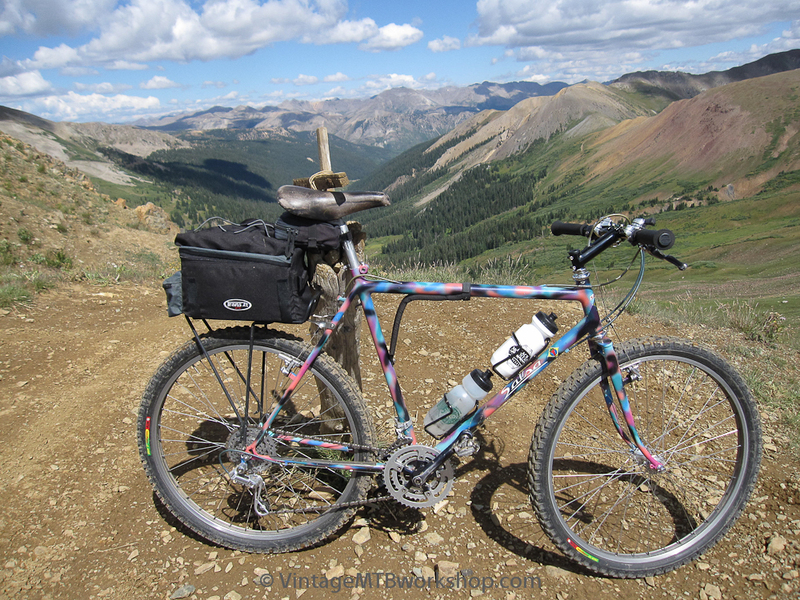 An old mountain bike felt even more out of place now in the up-scale Aspen of today.